Even before the emergence of myths and drama, our ancestors produced symbols to express the meaning of existence and explore the mystery of their condition. 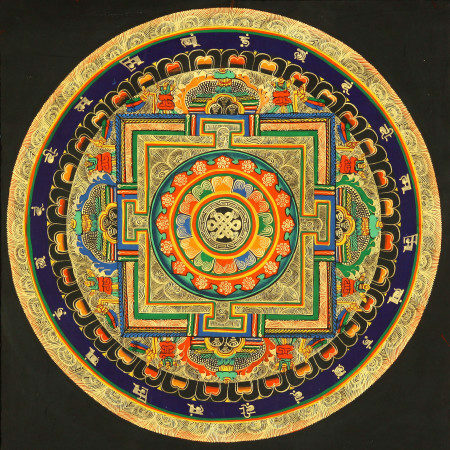 No image encapsulates the pattern of human experience quite so precisely and succinctly as the ancient mandala, rendered most elegantly in the icons of Tibetan Buddhism, but dating back dozens of millennia to man’s most primordial symbol making and as far forward as his most contemporary dream weaving. Stripped bare of its elaborate ornamentation, the mandala essentially consists of three basic elements: a small circle, enclosed by a square, enclosed by a large circle. As I see it, these three simple shapes correspond ever so neatly with the three elementary components of every great story, namely every great myth that has endured the ages. In The Odyssey, the classic hero’s tale, we have departure, adventure and return. In the Riddle of the Sphinx we hear of childhood, manhood and old age. The Book of Genesis speaks of Paradise, Paradise lost and Paradise regained, or in the parlance of the New Testament, we have birth, death and rebirth. These are but four of the best known examples, from which we could extrapolate endlessly to draw parallels with every familiar storyline. In other words, the simple geometry of a mandala acts as a metaphor for the simple structure of the myth, which is a metaphor in itself. So, let’s see if we can’t do a little unpacking here to unravel the meaning and the symbols of human experience. Our story begins in the small circle. A one-sided shape with neither top nor bottom, the circle signifies wholeness, unity. This is the circle of bliss, in the ignorance of infancy, where the undeveloped and undifferentiated psyche draws no distinction between itself and the other. Then the child grows and enters the square, defined as having a top and a bottom, a left and a right, perfect pairs of opposites. As she encounters the unknown, the child must learn to classify things, to differentiate between good and bad, and to categorize the objects of her world into neat little boxes. The hero spends a lifetime navigating this terrain, which many mandalas aptly portray as an intricate maze, much like the labyrinth of the Minotaur. The rigorous complexity of the square eventually takes its toll. The unity collapses, fracturing into all those pairs of opposites. In maturity, the mind requires order, logic, and categorization. We learn to identify things as good or bad, male or female, healthy or unhealthy. Everything must belong to one category or the other. The individual longs for the simple unity it knew in the womb or in childhood. But there’s no going home again. To fulfill his destiny, he must advance to the next level, and this metaphor functions equally well for every stage of development and maturation. When the going gets rough, you can’t just move back in with your parents and resume the life of a happy child anymore than you can squeeze your toothpaste back into the tube. And yet, how many unhappy adults do we know who try to pass themselves off as happy adolescents? Finally, the initiate rescues the princess; the martyr is reborn and crowned king; the Jedi knight reconciles the forces of darkness and light. The protagonist overcomes his challenge after grappling with the pairs of opposites, and he comes to terms with good and evil, right and wrong, earthly and divine. The cycle is now completed in this state of enlightenment. He enters the higher circle and recognizes his oneness with an understanding he never had as a child. He has differentiated himself from the other, wrestled with the unknown, and now he embraces a unity vast enough to include all of it. The terminology of archetypal psychology describes these three stages with marvelous clarity. The mandala diagram essentially illustrates what Carl Jung calls unconscious perfection (of childhood), conscious imperfection (of middle age), and conscious perfection (of old age). We may recall a passage of the Bible that puts it similarly. “Except ye become as a child, ye cannot enter into the Kingdom of Heaven.” (Matthew 18:3) Indeed, the ultimate destination is a circle, just as the starting point is a circle, but a circle at a whole other order of magnitude. It is vitally important, in the imagery of the mandala, that each shape is contained inside the other. Moving from one level to the next does not mean abandoning the previous stage, but requires the act of transcending and including. This is worth remembering through any and all stages of maturation, for the initiate will inevitably be tempted to reject his prior identity and cling to the “better” and more sophisticated self. But this is a mistake. The true sophisticate will retain all of it, understanding that even those inferior qualities contribute something valuable to the whole. The large circle seems to represent the highest realm of consciousness, enlightened Buddhahood and oneness with the divine. For most of us then, the mandala provides a helpful roadmap for spiritual development, even as we realize we are unlikely to attain that state of total nirvana on any regular basis. It this case, it is useful to see the image as a metaphor for incremental improvements, as we climb upward step by step. So don’t get too comfortable when you reach the big circle; it is not the finish line, but merely the opening of the next mandala, in a cycle that repeats itself indefinitely, as we continue to step out of our comfort zones and into the unknown, always striving to include and transcend and grow as humans. Finally, we can read the mandala as a metaphor for human development on a larger, historical scale. In antediluvian times, our as forefathers gathered around the fire, danced naked in the moonlight, and threw virgins off of the pyramids, they experienced a unity with god, or imitatio dei. Even in more recent history, the prophets and patriarchs of the Old Testament spoke to God, through angels and shrubs. Only in the last three or four centuries, thanks to the paradigm shattering discoveries of Galileo, Kepler, Newton, etc., whose discoveries literally moved the earth, mankind has been driven into a quagmire of spiritual uncertainty where God is dead. We have succeeded in naming the elements, categorizing the life forms, and dating the universe, but we have separated ourselves from Mother Earth and Father Sky. We have learned to dominate our environment, but at what cost? The last century has seen a mad rush to return to the comfort of the small, infantile circle, in the form of religious fundamentalism, archaic astrology and backwards-looking wicca. Yet we know that this regression will get us nowhere, unless they can be directed at opening the larger circle of the One. In order to thrive and regain the state of blissful unity, we must move forward, we must take the next step up that spiraling staircase. Our faith in the forces of the market are no substitute for an immovable faith in the All Father, but this is where we have arrived. Adam Smith’s invisible hand cannot replace Neptune’s triton, but for many it has. To restore the lost paradise we must rediscover one another, we must reconnect with highest forms of human potential, we must abandon the false idolatry of materialism, and we must learn to see through the eyes of others as if they were our own. Further Reading: If you enjoy these sorts of metaphysical interpretations, you’ll also want to check out the following articles.